The UNGASS thematic debate: A step forward, two backwards? On 7th May, government delegates met again to discuss the upcoming United Nations General Assembly Special Session (UNGASS) on drugs in New York. There were great hopes for this event which was the very first official preparatory meeting taking place in New York. However, the organisation of the event itself turned out to be very challenging. The date for the debate was not set up until 6th March, and the official agenda was only distributed a few days before the meeting took place. The debate was composed of an opening session, two panel discussions and a short closing session. It was encouraging to see many member states promoting drug control policies based on human rights (including strong calls in favour of the abolition of the death penalty), health (including both access to essential medicines and evidence-based prevention, treatment and harm reduction services for people who use drugs), alternatives to incarceration for low level drug offenders, and alternative development for subsistence farmers involved in the production of drug-linked crops. However, the mainly progressive statements made in the first panel discussion were overshadowed by the repressive tone of the second panel, in which a majority of the statements focused on reinforcing current law enforcement strategies and addressing new challenges (more specifically NPS and the emergence of the dark net) with continued punitive responses. During the debate, unprecedented calls were made for a reform of the international drug control regime, the highlight of the session being when the Argentinian drug czar proclaimed “the treaties are not the Bible, they should evolve”. Unsurprisingly, these calls were counteracted by other member states (such as Russia, the USA, South Africa or China) defending the primacy and immutability of the international drug control treaties. 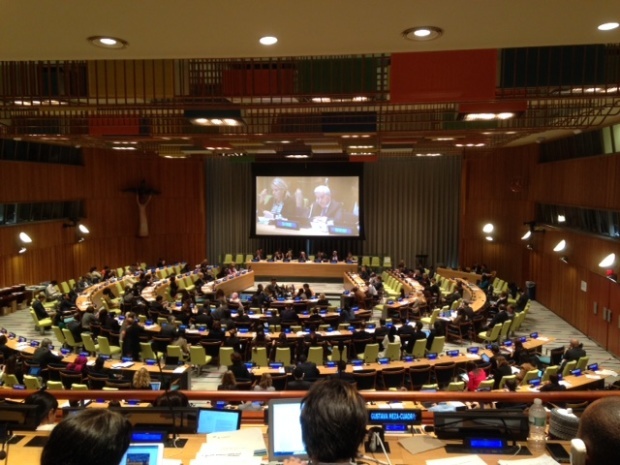 For many NGOs present in New York, the main disappointment was the space given by civil society in the debate. Although a representative from the Global Commission on Drug Policy was included in the first panel, and a representative from the Lebanese NGO Skoun spoke in the second, no NGO statement could be made from the floor. This was despite repeated calls from NGOs to be allowed to speak, and the fact that many member states did promote the valuable contribution of civil society in the UNGASS debate. Unfortunately, our contributions will only truly be valuable and meaningful if we are given adequate opportunities to speak and officially reflect on the success and challenges of international drug control in preparatory UNGASS meetings, and at the UNGASS itself. As the official NGO coordinating mechanism for engagement at the UNGASS, we also hope to see more government officials officially endorsing the Civil Society Task Force (CSTF). In New York, only Austria and the European Union mentioned the CSTF. At the margins of the official debate, the CSTF organised the 5th Civil Society Hearing. This was a good opportunity for NGOs to share their experience and expertise on policies and programmes centred on health, human rights and development. It was extremely positive to see strong youth and women advocates being given a voice at this hearing. We were pleased to see several government officials in the (rather small!) room. NGOs also mobilised at a protest to call for the abolition of the death penalty for drug offences. Prominent UN agencies – including UNAIDS, WHO, UNDP – also played an important role in the event, offering interesting insights into the impact of current drug control on areas of their work, and how a new approach could better promote the overall UN vision and mission. UNDP in particular was excellent in outlining the key human rights and development challenges for the debate. These inputs were made during two key side events, one organised by UN University around drugs and development, the other organised by UNAIDS, Harm Reduction International, Open Society Foundations and the Global Commission on Drug Policy on public health and drug control. As CND intersessionals are now in the planning to continue discussing the UNGASS preparations (the next meeting is to take place on 12th June), it is important that governments and UN agencies start giving civil society the space and primacy that it deserves. For a full and detailed account of the 7th May thematic debate and its side events, please click here.